Andrea Cooper and her mother, Laura are having lunch and celebrating Andrea’s thirty-first birthday at the Rise n’Dine restaurant at the mall of Belle Isle. Suddenly it feels like the world explodes. People are screaming and crying, trying to take cover. Andrea’s mother tackles her to the ground. What happens next shocks Andrea to her core. When it’s over, Andrea tries to make sense of what happened. Laura Oliver is a quiet middle-aged speech pathologist. She’s been a great mother to Andrea. She’s not the type of person who keeps secrets. But it turns out Andrea may not have known her mother at all. Why is her mother telling her not to speak to the police? She wants her to claim she can’t remember what happened. “Promise me, don’t talk to the police”. Then on top of everything else, her mother wants her to move out. She wants her to leave that same night. She says she needs space. Andrea is confused. Why is her mother acting so angry and cold towards her? Andrea wonders what she did wrong. But as she’s packing up to leave that evening something else happens that changes everything….and sends Andrea spiraling in a whole new direction. As she tries to figure out just who her mother really is, Andrea learns more about herself as well. But is she strong enough for what’s ahead? Will Andrea be able to save her mother? And herself? Karin Slaughter excels at storytelling. Her novels are known for their heart-pounding intensity, twists and turns, and well-developed characters. This was an exciting and intense read that had me gripped, wondering what was going to happen next. The majority of the story alternates between Andrea’s mother’s point of view in the past and Andrea’s point of view in the present. I liked the length of the chapters and found it easy to follow the alternating viewpoints. 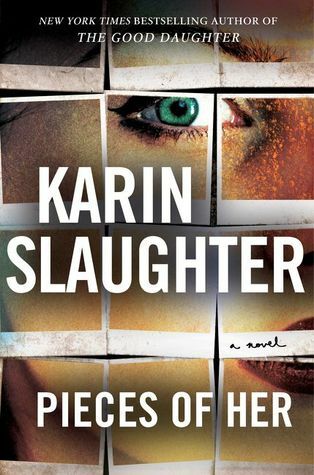 “Pieces of Her” was a well-paced intriguing read with some very startling and unexpected twists. As usual, the author has written an exciting story loaded with suspense and fascinating characters. I am a proud member of the “Slaughter Squad” and I can’t wait to read what the author writes next. Thank you 🙂 I’m glad you liked it too! I’ve heard great things about Karin Slaughter, and I’m still confused with what I should read first from her thrillers. This one sounds like a good one as well! Do you recommend it as my first book by her, or do you recommend something else, maybe reading it in order of publish date? I do not mind violence at all, so it’s definitely not a problem for me. Thanks for the input! She can do no wrong in my book. Love her! Great review, Deanna! Can’t wait to get to this one. Fantastic review I like the sound of this one. Great review. This one does sound quite thriller. Fab review Deanna. Great review, I really enjoyed this book! Thank you! I’m glad you enjoyed it too! Great review Deanna! I recently read and reviewed this book as well and I loved it. Thanks, Michelle! I”m glad you enjoyed it. Your review is great!! Love your review – and I loved the book as well!